Since 1901, Nashville has enjoyed virtually continuous professional baseball, the only interruption being a 14 year dearth that occurred between the Nashville Volunteers' final season in 1963 and the Nashville Sounds' inaugural season in 1978. Interestingly enough, the earliest images I could find of anyone wearing a Nashville Sounds cap or uniform was from a 1981 team set issued by Arby's. Yes, that Arby's. 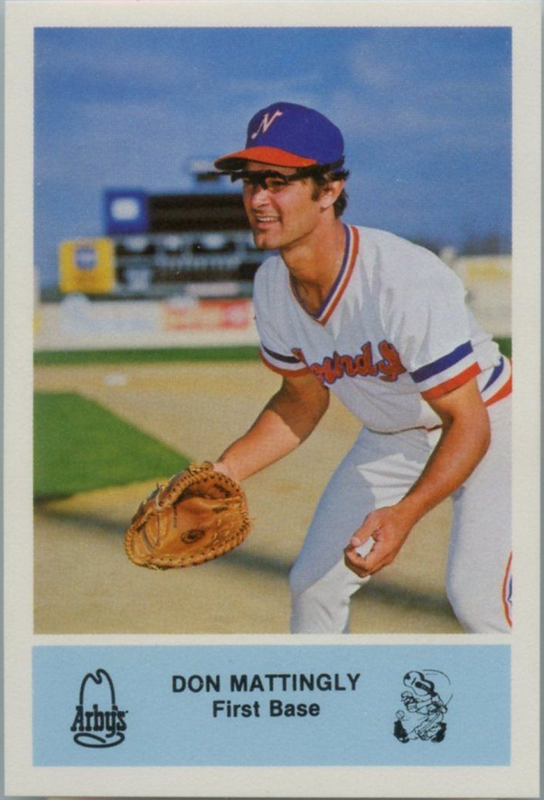 Here's a card from that set showing Don Mattingly in this iconic get-up. 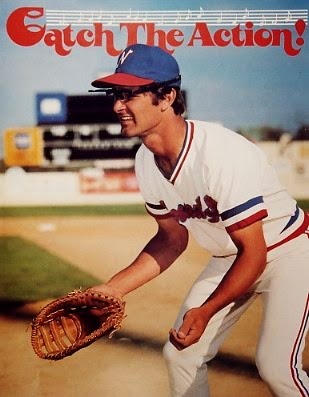 It looks like that same photo shoot also provided the shot used for a 1982 Nashville Sounds promotional schedule with Donnie Baseball's appearance on the cover! 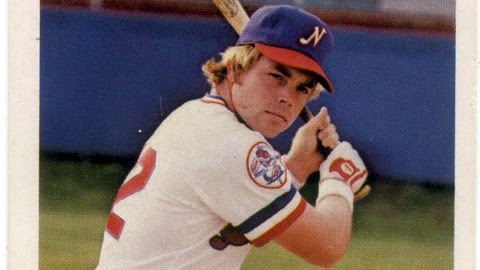 Another well loved Nashville Sounds alumnus is 3-time American League Manager of the Year, Buck Showalter. Buck is seen here donning the official cap of Music City as well as his trademark scowl. The cap I'm showcasing today doesn't go as far back as the cards shown above, but it's not from too long after. After comparing the New Era sweatband tags among a few different caps that I've previously posted about, I found that the tag on this Nashville Sounds cap is almost identical the one on this 1980's Milwaukee Brewers Cap as well as one of the caps from this post on Throwback White Sox Caps. While the Sounds cap has a white sweatband, each of those caps feature leather bands. This typically signifies that the cap is older as most teams switched from leather to cotton around the same time however I don't believe that a leather band is always a definite indication of a cap's true age. I rely on the tags telling the story because they often seem to vary year after year while the sweatband variance probably had more to do with whatever material was available at production time. Take a look at these posts on a 1990's Columbus Clippers Cap and these 1980's Albuquerque Dukes and Denver Zephyrs New Era Caps. The New Era tags on those hats are identical to the one on this Early 1990's Seattle Mariners Cap which leads me to believe that it has to be more recent than this Sounds cap. You'll notice that the Mariners cap has a "Diamond Collection" tag and the Batterman logo on the rear. Because those tags started showing up around 1992 - and also because this site tells me that this Mariners logo only existed from 1988 through 1992 - I'd say that if New Era distributed its tags evenly, then this Sounds cap is probably from 1991. As always, I'd gladly entertain commentary from anyone who has a differing opinion on the matter but for the time being, I'm sticking to my story. Just to let y'all know that for everyday wear, I'm adding a trumpet hat/lapel pin to the front of the cap to keep the musical theme alive. This cap has been on my wishlist for so long and what I've always appreciated most about it is how long they employed this logo featuring a letter "N" that resembles music notes. Is there any classier way to celebrate Nashville's greatest attribute than to incorporate it in the logo of its hometown team? While the logo pays tribute to Nashville's rich musical history with a letter "N" shaped like a guitar's f-hole over a guitar pick, a great number of voices called out that the colorway was all wrong and that it would not pass muster. At that point, Brandiose regrouped and decided to swap out the mustard for ketchup. The new "new" logo would now feature the same style of letter "N" as featured in the original mock-up, however this time in the more familiar black and red colorway that the Sounds have employed since 1998. In recent years, the most hotly contested logo reboots seem to either flop immediately or result in resounding accolades. Either way, both hype and vitriol can too easily be spread through social media outlets which is why we must be patient when evaluating this particular campaign's success. Ultimately, the deciding factor is what the finished product looks like on-field come opening day. Brandiose's track record shows that it has never been afraid to take risks as they've done here so I have no doubts that we will be showering them with acclaim once again when it's time to ring up the curtain. This cap has some sentimental value to me so it isn't for sale or trade however don't hesitate to reach out if there's something you like on the Trading Block and you are willing to part with any of the hats on my Wish List.